This enthralling satin silk kimono is sure to charm. The fabulous, riveting design of animated orbital patterns is infused with color, whimsy, and horse play. A mélange of vivid red, lime, and black circular motifs sparkle on a glowing pearly-white ground that is elegantly framed by a ruby red border Kabuki trim. 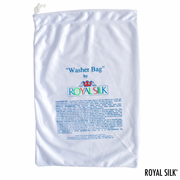 Fashioned in buttery satin silk that will feel light, creamy and luxurious against the skin. Two large front pockets to snuggle your hands. One size fits all (34” to 48”). Length is about 33”. Pure Silk. Imported. Hand wash or dry clean. 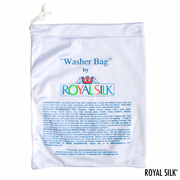 Or safely machine-wash this silk kimono with our exclusive Washer Bag for silks (purchased separately). Imported.